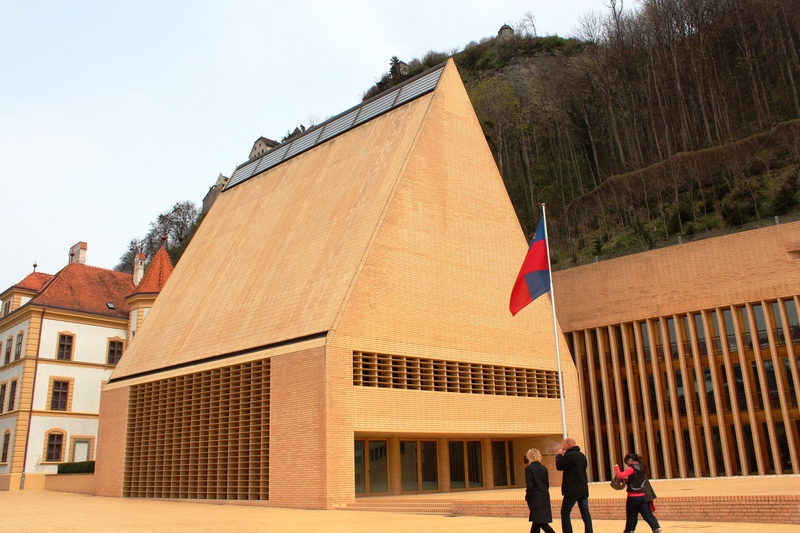 VADUZ, LIECHTENSTEIN: Liechtenstein, officially known as Principality of Liechtenstein, is the 3rd smallest country in Europe and 6th smallest in the world sharing its borders with Switzerland and Austria. It is the only country laying entirely in Alps. It’s capital Vaduz is a cozy, little town that gives magnificent views of the mountains and Rhine valley in almost every direction you look. This is a very neat and clean city with many helpful friendly locals. Tourist can spend days in this tucked away city of Vaduz exploring the mountains and the nearby villages. Its amazing how a country this small has so much to offer to its guests and locals. TIME of TRAVELLING: We took a long road trip during the Easter break of 2012, around first week of April. This was our last stop amongst 6 other cities. It took us about 6 hours (~ 370 miles) by car to reach here from Ljubljana, Slovenia. Since Vaduz is surrounded by the Alps, summer comes here late. It was still a bit chili around that time. We had to wear jackets and hats during our visit. OUR HOTEL: Vaduz is an expensive city. Hotels here can be very pricey too. We stayed in Dornbirn, Austria, about 22 miles away from Vaduz. Our hotel was Harry’s Home Dornbirn. It was literally walking distance from the city center of Dornbirn. Our room had a kitchen with stove, microwave, and a small refrigerator and it was nicely decorated with very modern and contemporary art works and furniture. I felt like I am living in an IKEA world. Breakfast and Wi-Fi weren’t included but we received great customer service from the front desk people. 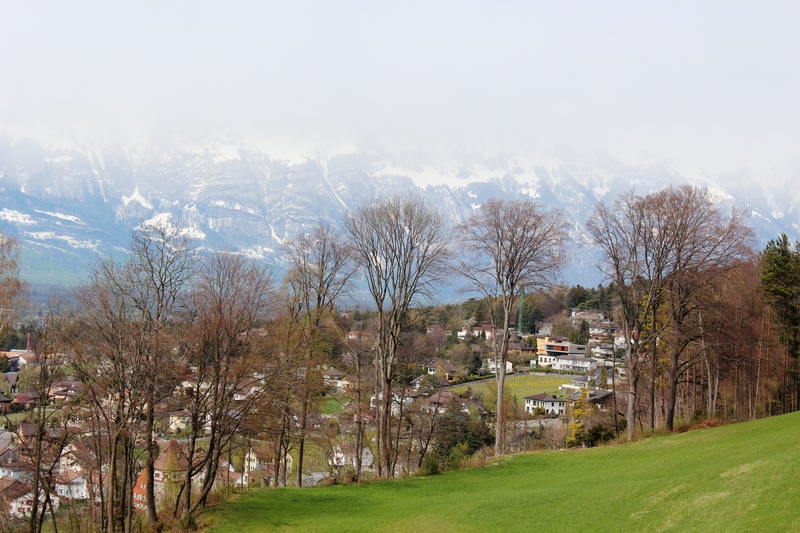 WHAT TO BUY AND EAT IN VADUZ: One of the best thing you can buy from Vaduz is cuckoo clock. They come in different types and price ranges. The cheapest one we saw was around 125 euros. You can get battery operated or the traditional winding clocks. These clocks are hand-made in Black Forest region of Germany. Other than that Swiss knives, watches are very popular here, since Switzerland is just around the corner. There is a big souvenir shop on Stadtle (the city center/pedestrian street). Again, since Switzerland is right there, you shouldn’t miss the opportunity of eating lots and lots of silky Swiss chocolates. You will find them almost at every souvenir shops. 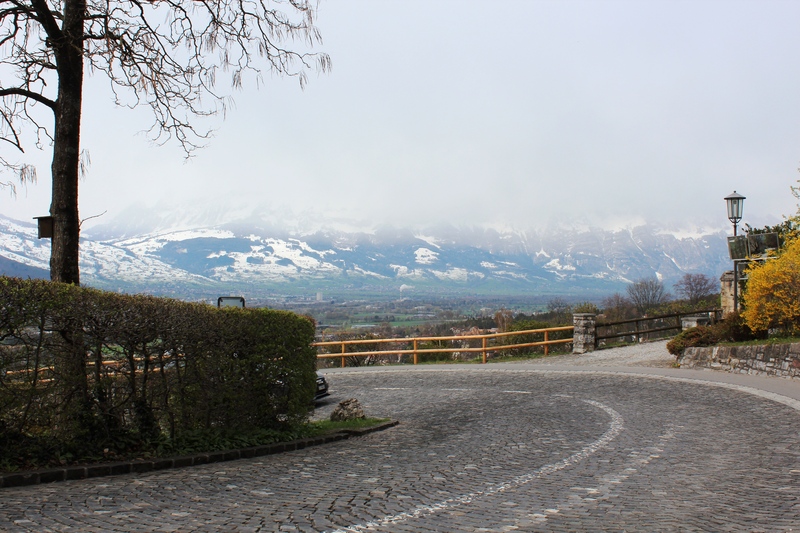 PLACES WE’VE VISITED: Although Vaduz is a very tiny city in a tiny country of Liechtenstein, you can spend hours to enjoy the breathtaking views of Alps and its surrounding small villages. We spent only few hours there, but the scenic views of this small town are unforgettable. 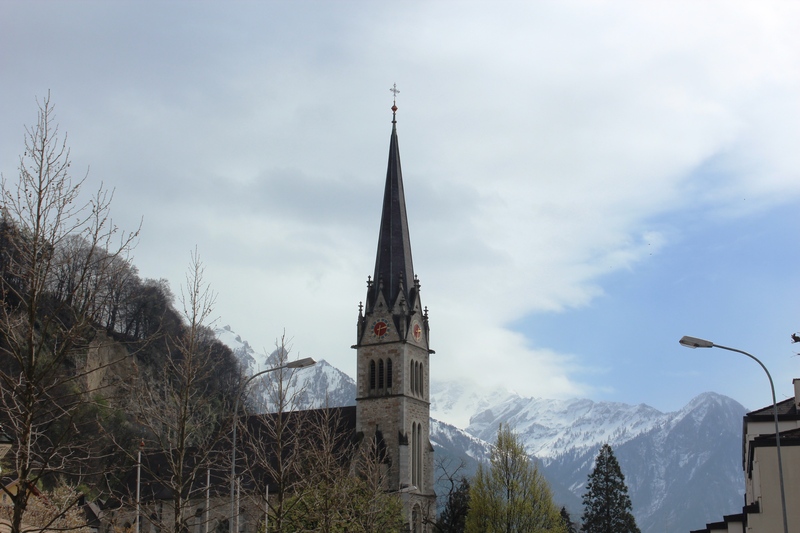 1) CATHEDRAL of ST. FLORIN or VADUZ CATHEDRAL: This is a neo-Gothic church which was built in 1874. It is beautifully situated at the beginning of the city center Stadtle and right beside the Vaduz Music School. Although it is not as impressive inside as out, it is well worth a visit. There is a set of very beautiful bronze sculptures outside the church below the steps. One of the sculptures depicts Mary holding new born baby Jesus and other one Mary holding the body of Jesus after his crucifixion. 2) STADTLE: This is the main city center and a very beautiful pedestrian street. It has Liechtenstein Parliament (the triangular building) at one end of the street, Government House (right beside the parliament) and Vaduz City Hall (with 2 horse statues in the front) at the other end. You will also see few museums on this street, like Stamp Museum and Land Museum (Kuntmuseum). Tourist information center is also located here. 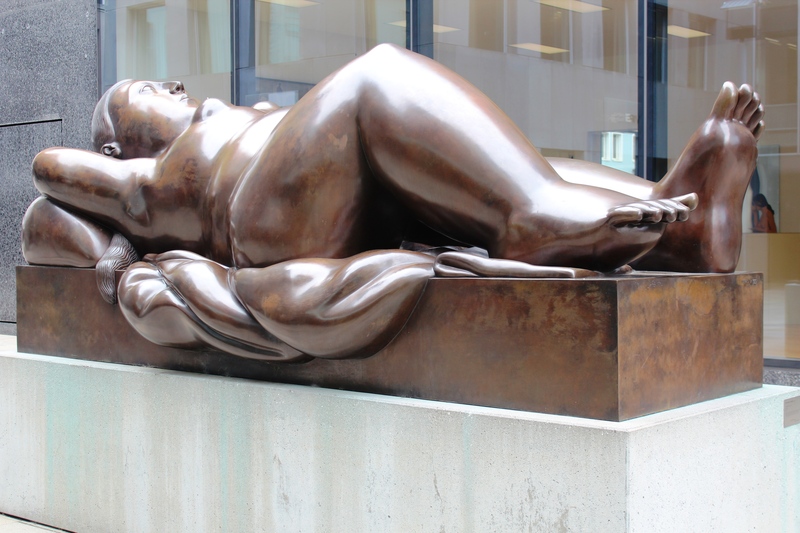 Enjoy the beautiful and interesting sculptures on this street. You can see Vaduz Castle up on the mountain from here. Cathedral of St. Florin is very close too, may be 5 minutes of walk. This is the center of town’s most shops, restaurants, and a popular gathering point. 3) VADUZ CASTLE: The castle is over 700 years old and underwent major restorations between 1905 and 1920. Currently it is the palace and official residence of the Prince of Liechtenstein. It is not open to the public and cannot be visited. 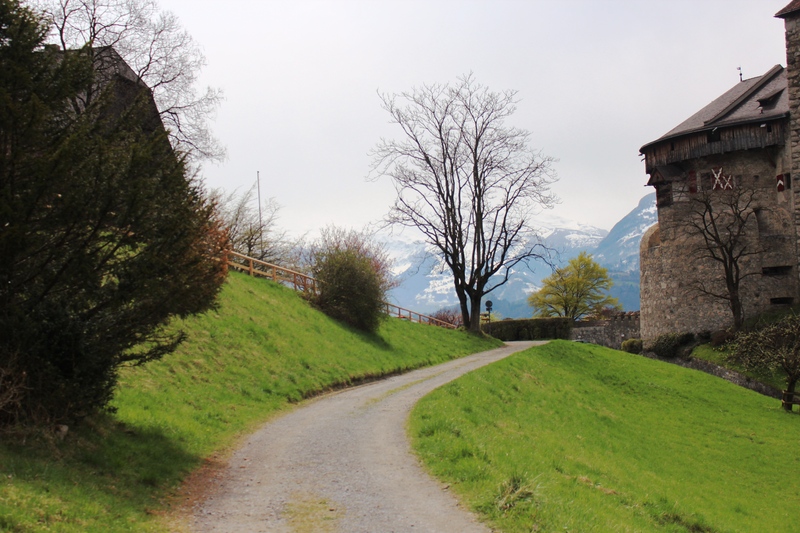 This is a must see in Liechtenstein. 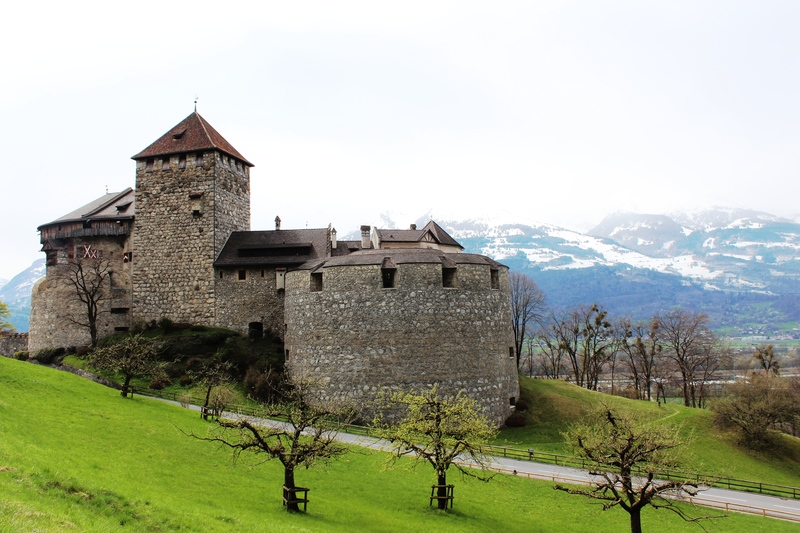 The castle is located on the hill high above the town of Vaduz surrounded by snow-capped mountains. It overlooks the adjacent villages at the bottom. You can take your car up there and park in the free parking area. Then go for a walk/hike and enjoy the fresh mountain air, green meadows, and white snowy mountains. You will get a breathtaking fantastic view of the Alps. 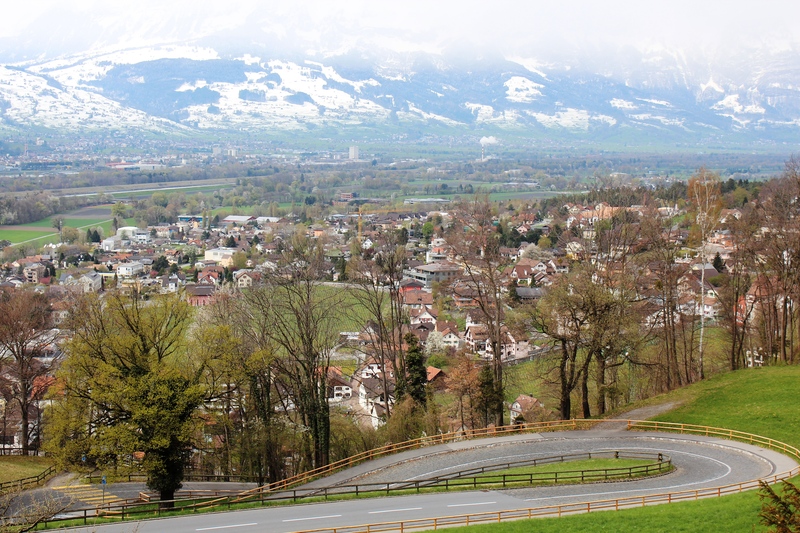 Just out of interest, isn’t Liechtenstein the 6th smallest country in the world? Thanks Alex, yes you are right…don’t know where I saw it’s the 7th smallest country. Will change it right away. I’ve never been to Liechtenstein! It sounds rather intriguing. And that castle does look magnificent.